Have you ever dreamed of camping in the real Florida - the old Florida - where it is so quiet that you can hear every bird chirp and every cow moo, where giant live-oak trees covered in drooping Spanish moss and clinging air plants provide beautiful shade and amazing scenery? Then Camp Mars in Venus, Florida is your dream come true. If you'd like to see what Florida looked like before theme parks and tourist traps, this is it. 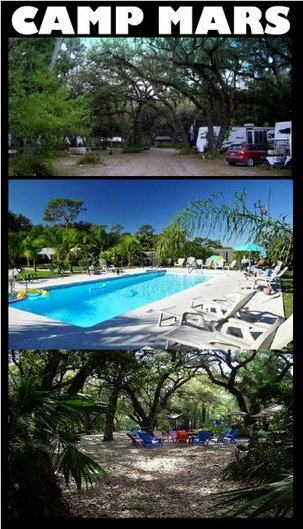 Camp Mars is situated on 40 beautiful acres in the undeveloped center of Florida with green pastures, lush tropical foliage, nature trails, ponds, a creek, live-oaks, a resident alligator and heated in-ground clothing-optional swimming pool. Dale Dunston and Tom Costello opened Camp Mars 9 years ago. "Dale and I purchased a non-operating campground and Camp Mars was created. We offer a true camping experience that makes us unique. Our repeat business rate and our long waiting lists for permanent weekend sites speaks to our reputation and popularity with our 7,000 members," said Tom. You don't have to be out of touch with the rest of the world at Camp Mars - unless you want to. We had a enough cell phone signal to send and receive both phone calls andtext messages. Camp Mars also has complimentary Wi-Fithroughout the campground! Camp Mars offers multiple camping options from primitive tenting to unique rental cabins to 30 and 50 amp full-hookup RV sites. Camp Mars is located at 326 Goff Rd., Venus, FL 33960. You can reach them by phone at 863 - 699 - 6277. In a world where we've become accustomed to human hustle-bustle, travel traffic congestion and non-stop noise, Camp Mars is "out of this world!"